Quote VR is now supported on Linux! - Vulkan API supported and recommended for VR. - This is waiting for updated SteamVR for Linux to be released. Once that is out, we will enable the Linux download for all owners. Hopefully one day I will be able to afford a Vive, but they are really expensive and I simply cannot justify the expense right now. Shame, as I would like to be converted to VR, as I'm still a big skeptic right now. Thanks for sending it to me mphuZ! Guest Will this same version be playable without VR? Because my debit card is waiting for that linux logo to appear, but I don't have VR. I don't think so. SSVR is a 180° shooter with very limited movement (limited by the size of your playspace with no artificial movement). An adaption for mouse and keyboard would probably be pretty boring - no movement, just controlling the crosshair / looking around and shooting. It looks as if Croteam would at least think about adding gamepad support to SSVR. both HD remasters are coming, i can't wait too. But what exactly does this mean: Will this game now work on Vive if I buy it, so I can just go get me the VR-set and hook it up to the set? Doesn't there need to be some sort of framework software in place as well, before I can connect the Vive to the PC? Is that what "SteamVR" is? Games need the steamvr runtime to work with VR, but isn't relaesed for linux yet. 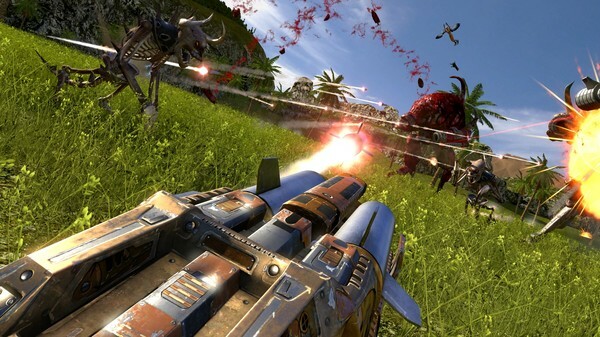 Serious sam is ready to work, with steamvr for linux that only developers have. At the moment that valve release SteamVR for linux all users, the game automaticly will be ready to be played. Beamboom Doesn't there need to be some sort of framework software in place as well, before I can connect the Vive to the PC? Is that what "SteamVR" is? Well, the drivers for the Vive itself are already working on Linux (and are part of the installable SteamVR package for Linux), with NVIDIA drivers at least - I already verified this by running a demo from the Vrui toolkit. What's missing from SteamVR is the complete UI package, including the VR version of Steam's Big Picture Mode, the status window for the VR hardware, the setup to switch between room scale and standing/seating mode and to measure your play space boundaries, the SteamVR tutorial and more. SteamVR is supposed to abstract things where I could technically use my rift DK2 and razer hydra for this right? I really like VR (enough to get a dev kit) but I'm not sure I can warrant getting another (finished) headset considering there's quite limited support. It's really great to see Croteam supporting Linux so well. I'm really looking forward to the Fusion Update 2017 for SS1-3 and the upcoming SS4. In the meantime I'm playing through the Talos Principle. If I ever get VR, I'll be sure to buy the SS VR games. In the meantime, they could just release the non-VR version on Linux first. It would actually have a larger audience too, at this moment. I was really hoping that VR headsets would get cheaper before I wanted one so bad. Valve developed a better and cheaper lighthouse and a new detection sensor for the headset, also they made a new controller. It's still in development but they will be more cheap than actual because headset will need less sensors and pieces and same for the new lighthouses.